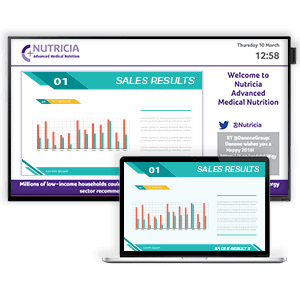 Many businesses can use Digital Signage to better communicate with staff members, helping to improve productivity and reduce the cost of poor communication. It can motivate staff through highlighting key achievements or displaying the latest sales figures for example. It’s an effective tool that allows messages to be distributed across multiple departments, floors, office building locations even different countries and continents. Below we’ve highlighted some of the ways in which Digital Signage can be used in corporate environments. Cut through the copious amounts of messaging with information that will not end up in their junk folders using Internal Communication Displays. Promote, motive and set targets giving viewers that extra boost throughout the day. Display live data feeds such as the news feeds, social and current company information to keep the workforce ‘in the know’. Interested? 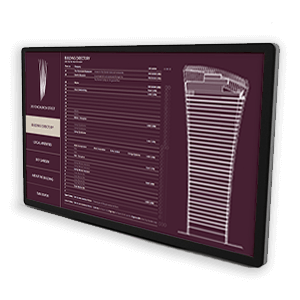 By using Digital Signage at Reception, staff can easily update the information they want to display. Welcome messaging, company achievements and awards, recent client projects and company news are all important pieces of information to help deliver the right first brand impression to visitors. 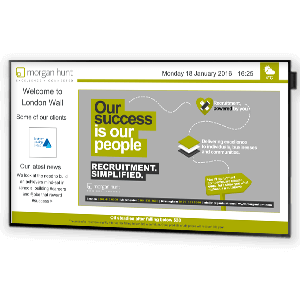 Presentation Signage Hybrid Displays are a great way to combine a meeting room presentation display with digital signage. 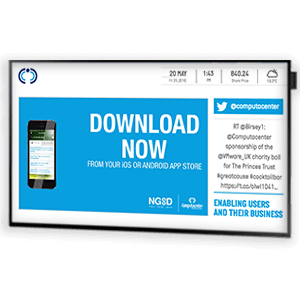 Use the displays for digital signage and specify one area to show additional content from an external source such as a HDMI input from a laptop or similar. Interested? Get more content into your signage with IPTV servers and HD encoders. Receive live TV channels and deliver them across your network (IPTV) or broadcast your own live content from cameras, media players and other sources using HD Encoders. Interested? 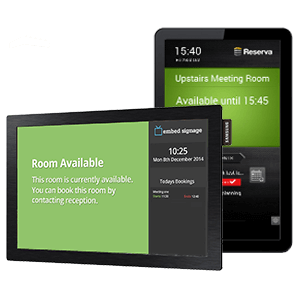 Digital meeting room signs are a great way to manage multiple meeting rooms. Display availability and booked events outside each room using an online calendar system or integration options with various calendar systems such as Office 365, Exchange, Opera and Delphi. When one display is not big enough, make an impact with a video wall solution. 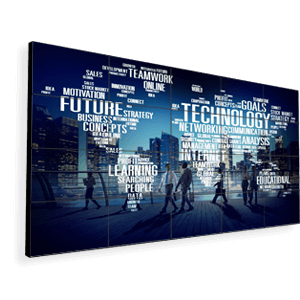 Potentially any number of displays or tiles can be combined to create the ultimate video wall – the jewel in your digital signage crown! Interested? Help visitors and staff get to where they need to be with Digital Wayfinding. Interactive or static layouts can both be extremely effective in displaying location information, creating an engaging and informative experience for the user. Interested? 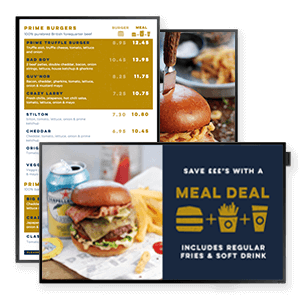 Use Digital Menu Boards at the office canteen / cafe locations to easily update and regularly change menu items helping to improve service, save on resource and print costs as well as increase sales by up to 50%.